As 2017 draws to an end, it's time to mark my 2017 forecasts to market. Overall, the stock market in 2017 was remarkable. 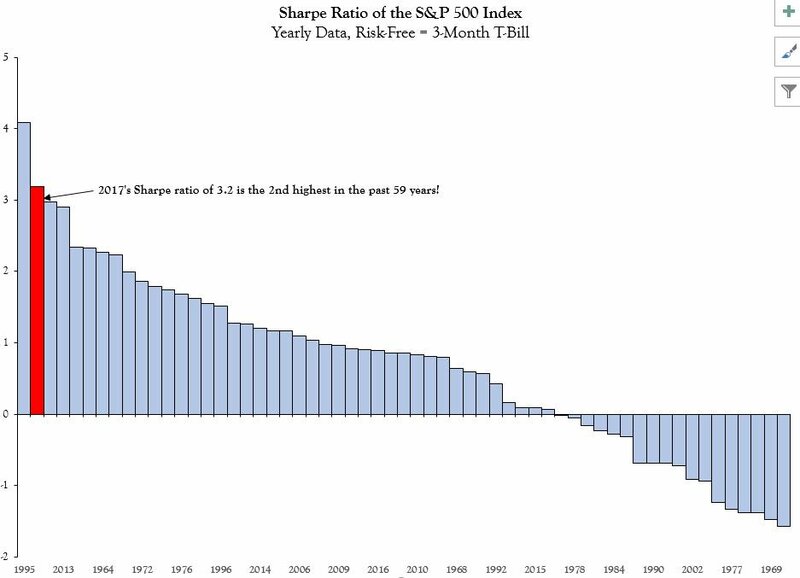 What if I told you that you could have had returns with a Sharpe Ratio of 3.2, using the 3-month T-Bill as the risk-free rate? 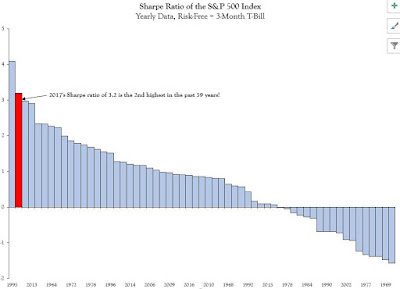 As it turns out, you could have achieved that with a simple buy-and-hold long position in the SPX, whose Sharpe ratio is the second highest in its history in the last 59 years (via Vincent Deluard of NDR). Indeed, US equities rose steadily in 2017. The drawdown was only 3% in the year, which is a feat that was last achieved in 1995. With that in mind, I review my inner investor and inner trader calls of 2017. My inner investor gave himself a grade of B+, and my inner trader gave himself an C+ for the year. The end of December is filled with analyst forecasts for the following year. 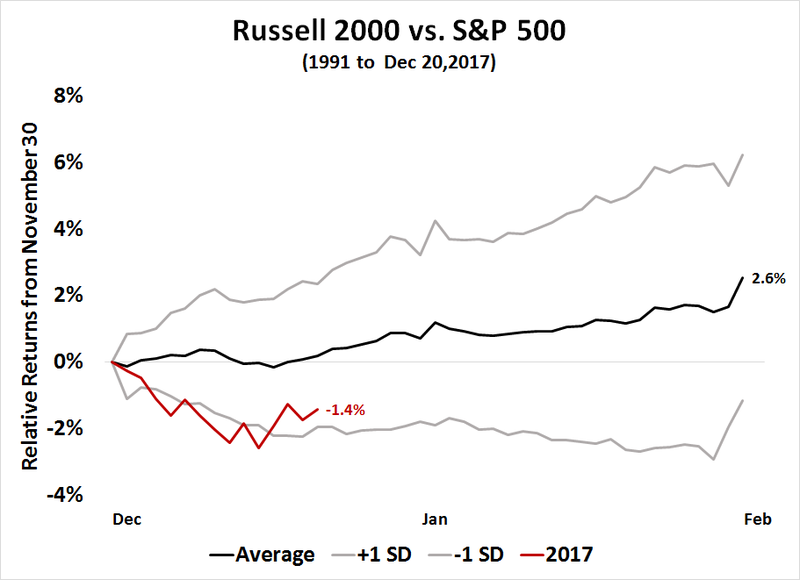 I would like to take this time to debunk some of the doomster myths about the stock market, and to outline some of the true risks that I worry about in the year to come. 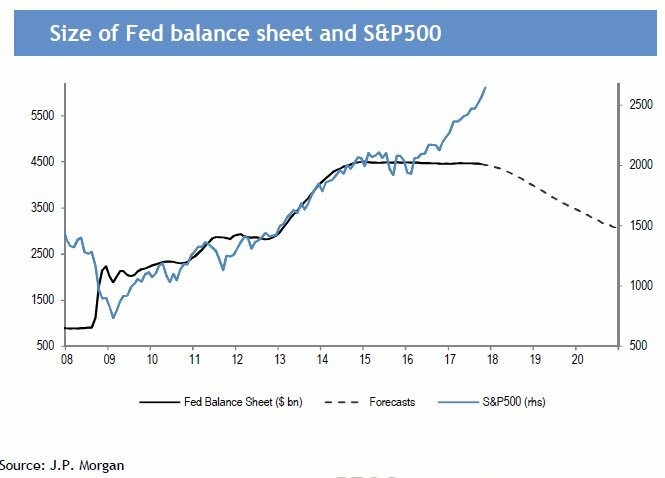 One of the major myths that have been trotted out is the relationship between the Fed's balance sheet and stock prices. While this chart appears impressive, it is an illustration of the adage about correlation does not equal causality. Instead, investors could be much better served to focus on earnings, with does have a direct causal effect on stock prices. 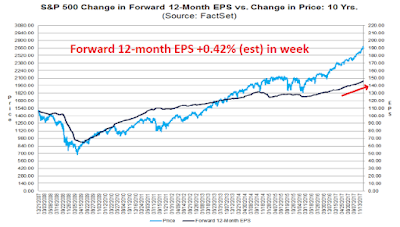 Forward 12-month EPS is coincident with stock prices, and they are rising. Donald Trump’s singular accomplishment, in my view, is the ignition of Animal Spirits in the stock market and the real economy. Small business confidence measures shot up from the week of his inauguration and have remained elevated ever since. PE multiples expanded throughout the course of the year, which was not solely due to his tax policy – it was also about his swagger and I-don’t-give-a-f**k persona. Indeed, the animal spirits in the stock market began to run wild starting in September, when the weekly RSI became overbought and stayed overbought. 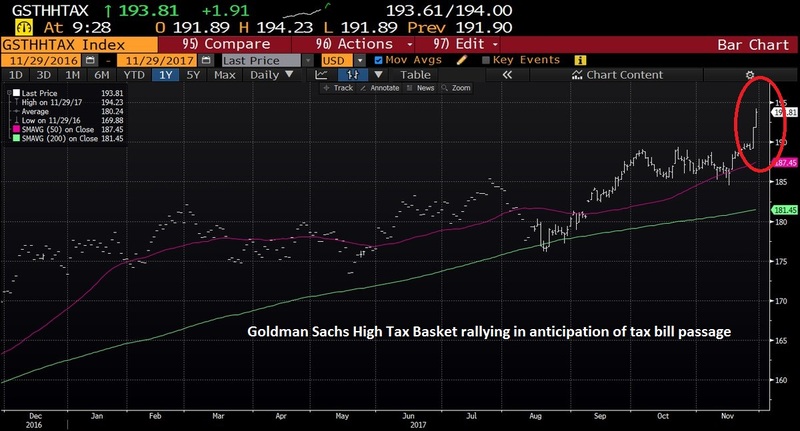 My former Merrill colleague Walter Murphy called this a "good overbought" condition, where the market continues to advance while remaining overbought. 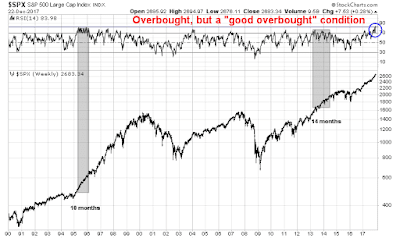 Since 1990, there have been two episodes when the market flashed a series of overbought readings. One lasted 10 months, the other lasted 14 months. 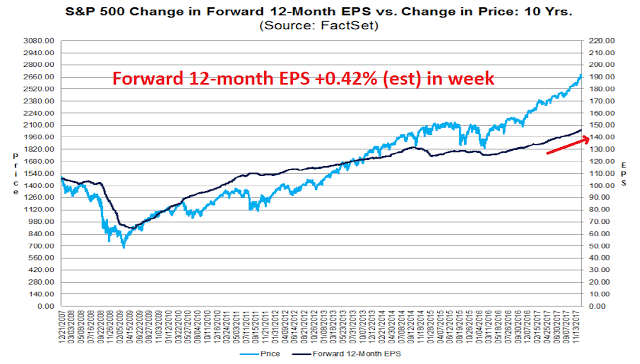 In both instances, stock prices were significantly higher afterwards. 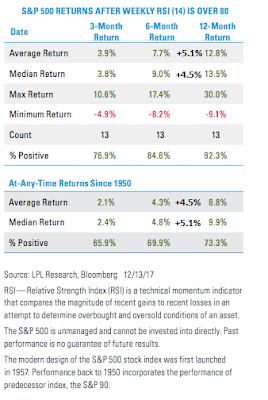 LPL Research quantified the "good overbought" effect on market returns using data that went back to 1950. They found that past episodes of weekly RSI above 80 has been bullish for equity returns, though the sample size is still low (N=13). The table below from LPL, which I edited and annotated, shows that the excess return from the price momentum effect fades out after six months. 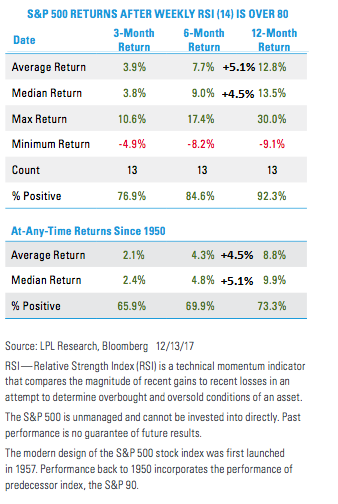 The incremental return from six to twelve months when when weekly RSI > 80 is not significantly different from the "at any time" returns. This week, I review the sector leadership of the stock market. The analysis reveals a late cycle market characterized by price momentum leadership, and expectations of increased capital expenditures, as well as emerging leadership from inflation hedge sectors. Mid-week market update: There is not much that can be said about the stock market that I have not already said. The small cap seasonal Santa Claus rally that I wrote about appears to be proceeding as expected, though the tape is thin and most professionals have shut down their books for the year. Next week is Christmas. It is said that the three kings visited the infant Christ with gifts of gold, frankincense and myrrh. 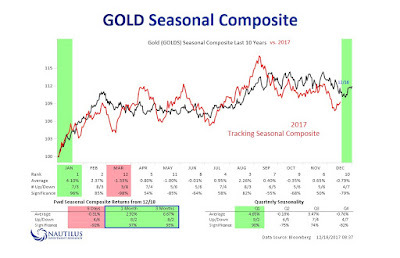 While there is no active and liquid market for the latter two gifts, gold is still traded and an update on the outlook for gold would be timely. Gold is getting intriguing. 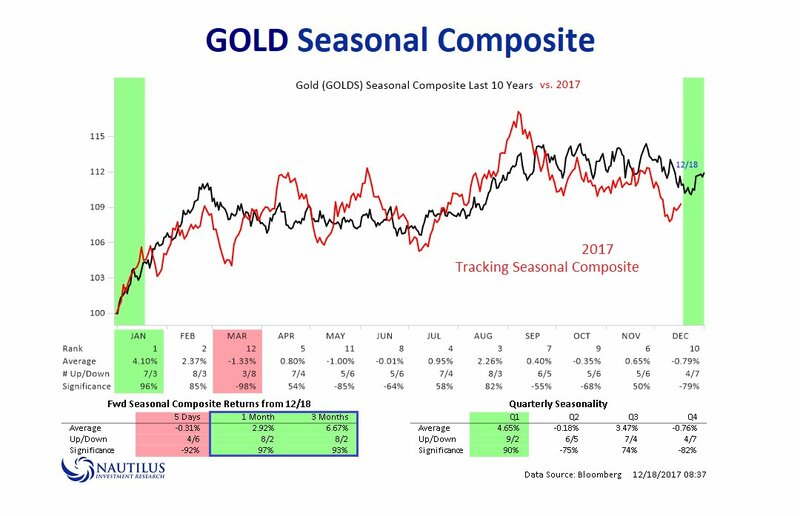 Analysis from Nautilus Research indicates that we are entering a period of positive seasonality for gold. At the same time, gold stocks are testing a key relative downtrend line. Should it rally further, it would be a signal of possible further future strength. Five steps, where's the stumble? What happened to 3 steps and a stumble? As expected, the Federal Reserve raised rates by a quarter point last week and re-affirmed its dot-plot projection of three more quarter-point hikes next year. What happened to "three steps and a stumble"? The old Wall Street trader's adage of "three steps and a stumble" refers to the stock market's reaction to Fed rate hike cycles. 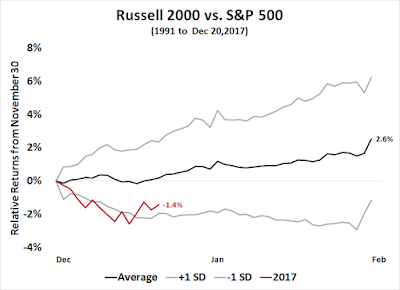 At first, stock prices don't react to the Fed raising rates, but eventually the market succumbs to the economic cooling effects of monetary policy, and a bear market usually begins after three rate hikes. Hence, "three and a stumble". 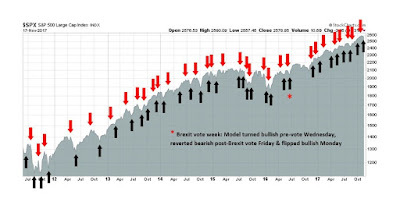 The chart below from Ned Davis Research shows the effects of this rule on the Dow. 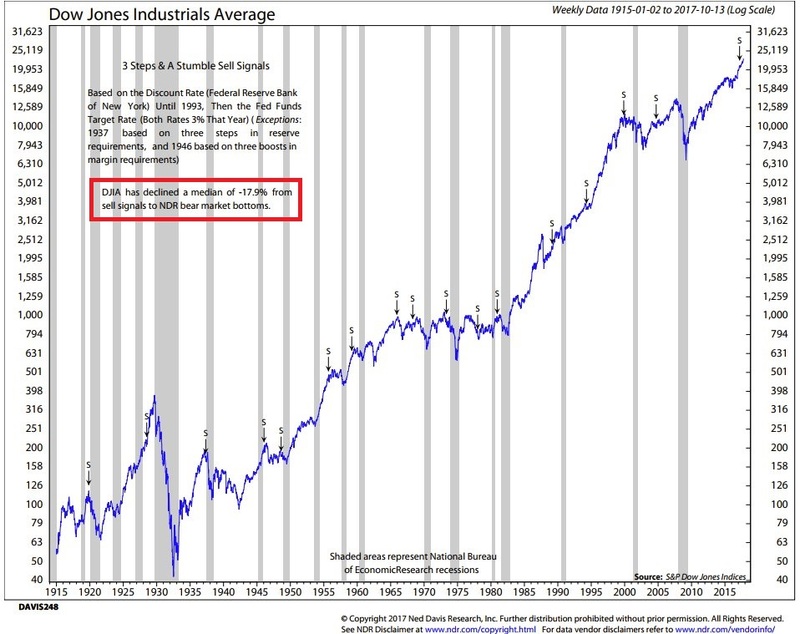 Historically, the DJIA has declined a median of -17.9% from sell signals to NDR market bottoms. 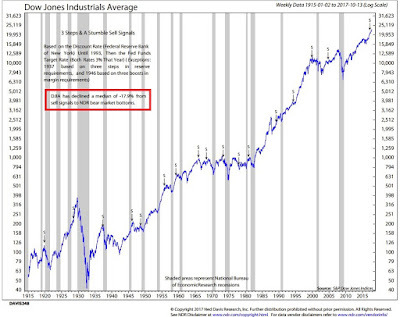 Historically, the sell signals have been fairly prescient, though sometime early. This expansion cycle has been unusual in that the Fed began raising rates two years ago. We have seen five consecutive quarter-point rate hikes, so where's the stumble? Mid-week market update: You can tell a lot about market psychology by the way it reacts to events. News overnight of the victory by Democrat Doug Jones over the troubled Republican candidate Roy Moore in the Alabama senate race was judged to be market unfriendly, as it meant that the GOP would have its Senate majority shrink by one vote to 51-49. ES fell immediately, but eventually recovered to roughly even the next morning at 8:30 before the release of CPI. The near term message from the market is "stock prices don't want to go down". Rob Hanna of Quantifiable Edges observed that this week, which is December OpEx, is one of the most bullish weeks of the year. Moreover, positive seasonality extends past this Friday for another two weeks. A decent interval has passed since China's 19th Party Congress (see Beware the expiry of the 19th Party Congress put option), and it's time to check in again on China to see how things are progressing. 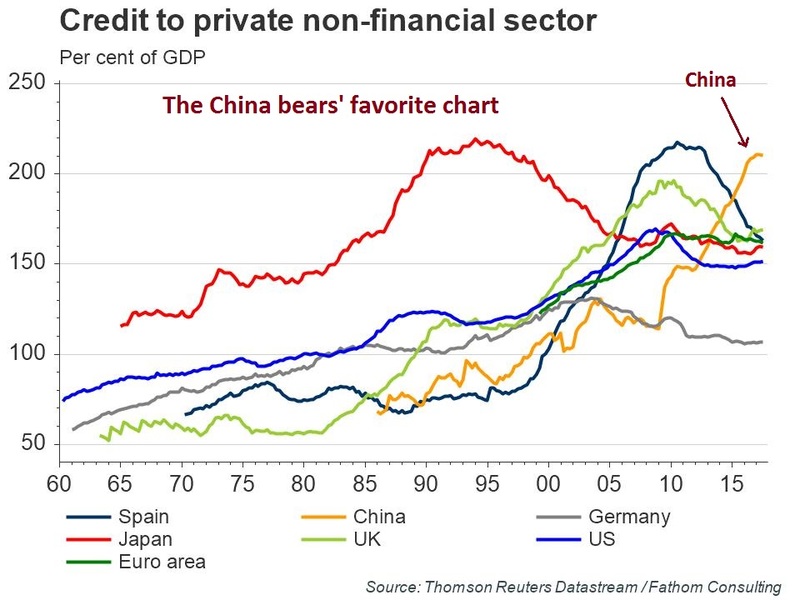 For the China bears, the overhang in debt looms large. Excessive debt: In particular, concerns were raised over the rapid buildup of debt to keep non-viable zombie companies alive. Growth of shadow banking: The growth of the shadow banking system makes it more difficult to monitor and control the risks in the financial system. Moral hazard: The IMF also raised concerns over "moral hazard and excessive risk taking" because of the belief that the government will bail out troubled state-owned enterprises (SOEs) and local government financing vehicles (LGFV). 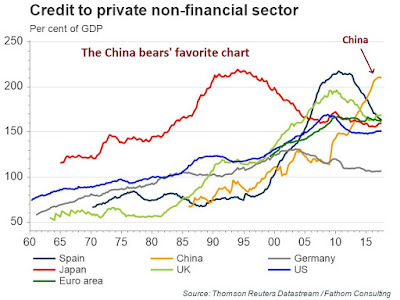 The concerns raised by the IMF echoes the writings of Winston Yung at McKinsey, who penned an article called "This is what keeps Chief Risk Officers in Chinese Banks awake at night". Friday's November Jobs Report highlighted a number of important bullish data points for the stock market in the weeks ahead. The headline non-farm payroll release came in ahead of expectations, while average hourly earnings missed. At the margin, tame wage pressure which will restrain the Fed from becoming overly aggressive in raising rates. 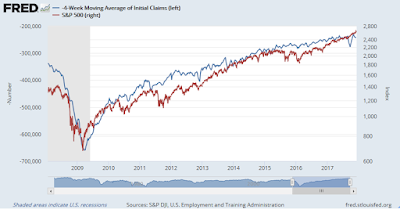 As well, Thursday's release of initial jobless claims also underlined the remarkable inverse correlation between initial claims (inverted scale) and stock prices. So far, the continuing improvement in initial claims is supportive of higher equity prices. The nowcast and the near term forecast remain very positive, with only relatively strong oil prices juxtaposed with relatively weak commodity prices as flies in the ointment. The longer term forecast, which I briefly downgraded to neutral, is weakly positive again. Throw in the anticipated corporate tax cuts, it is difficult to contain our short-term enthusiasm. 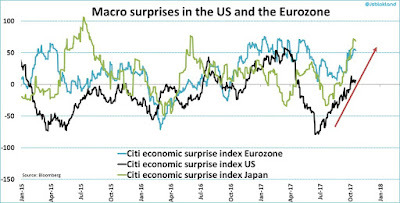 This week, I review my Recession Watch indicators and find that the current snapshot of recession risk is receding, though there are still some key risks on the horizon (also see Things you don't see at market bottoms: Rational exuberance edition). Mid-week market update: Swing and day traders are often fond of studies that show an edge under certain market conditions. But what happens when two different studies disagree? On one hand, Rob Hanna at Quantifiable Edges published a study yesterday that signaled a likely bullish outcome for stock prices. Yesterday (Tuesday) would have day 1 of that study. On the other hand, I had identified a hanging man candle on Friday. 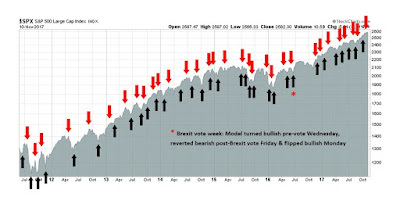 While hanging man formations are thought of as bearish reversals, further studies showed that they don't necessarily resolve themselves in a bearish fashion unless there is a bearish follow-through the next day. 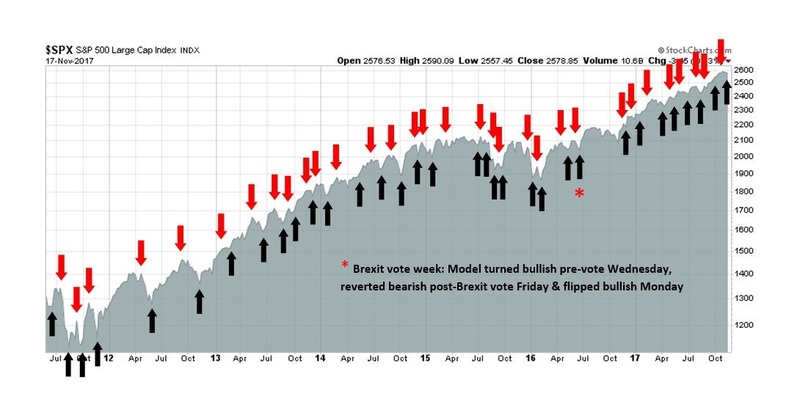 When the market opened up strongly on Monday, I had given up on Friday's hanging man, but the market astonishingly closed in the red to flash a bearish confirmation. 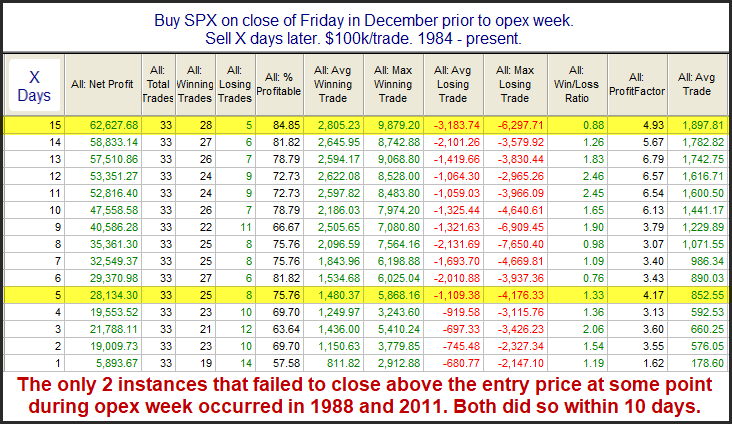 My own historical study indicates that these episodes tend to be short-term bearish, and bottom out between day 3 and 4, which translates to either this Thursday or Friday. How can we resolve this apparent contradiction in market studies? How worried should you be about an elevated Shiller P/E? 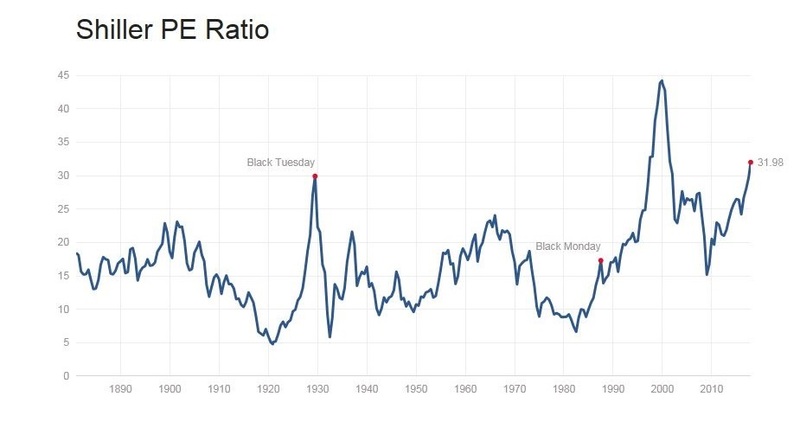 In my discussions with investors, the Cyclically Adjusted P/E (CAPE), or Shiller P/E, has come up numerous times as a risk for the U.S. stock market. The current reading of 32x is only exceeded by the peak during the NASDAQ Bubble, and it is higher than the levels seen before the Crash of 1929. Does this mean that the risk of a substantial stock market drawdown in the near future is rising? I studied the question in the context of some of the criticisms of the Shiller P/E and made a number of adjustments to the calculation. I found that the answer is the same. The U.S. equity market is expensive, but Shiller P/E does not work well as a short-term market timing technique. However, I have found that the combination of valuation and price momentum can provide clear warning signs that the market is about to enter a bear market. Equity market volatility, as measured by the VIX Index, has been extraordinarily low by historical standards. Let's examine each, one at a time. What's next for the tax cut bull? Mid-week market update: It was clear from yesterday's market action that the equity bull depends entirely on the success of the Republican tax cut bill. The market rallied on the news that the tax cut bill had made it out of Senate Budget Committee. It manage to shrug off the news of a possible government shutdown, and a North Korean ICBM test, which was later determined to have a range to reach the entire Continental United States. 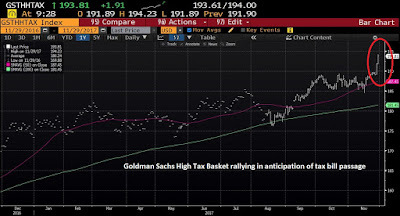 The combination of the market enthusiasm yesterday and the strength in the Goldman Sachs high tax basket indicates that the market is discounting the passage of the bill. I received a considerable amounts of feedback to my post last week (see 2018 outlook: Last charge of the bulls) over my comments about the risks posed by a flattening yield curve. 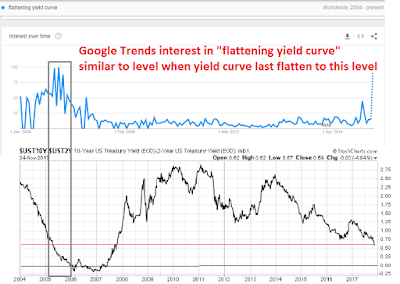 Interest in the term "flattening yield curve" has spiked, but consistent with levels last seen when the yield curve flattened to this level. 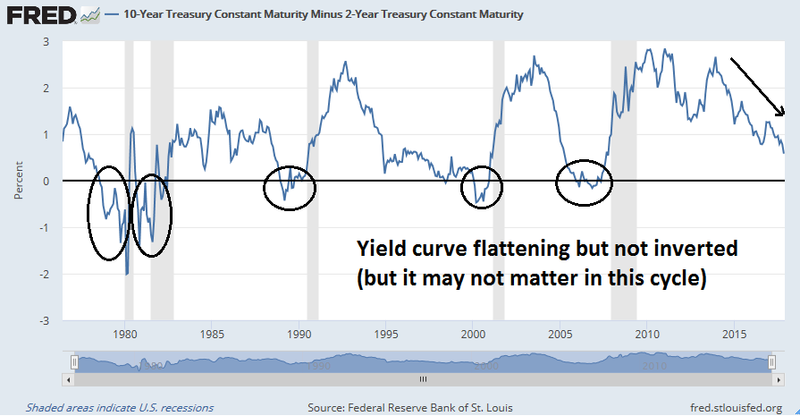 My readers highlighted some recently published articles indicating that a flattening yield curve doesn't matter. Scott Grannis wrote a thoughtful piece about the contrary indicators that point to a slowdown. Cullen Roche at Pragmatic Capitalism concluded that a flattening yield curve isn't a concern until it inverts, and that analysis from the Cleveland Fed indicated that the current yield curve implies a 12% chance of a recession. 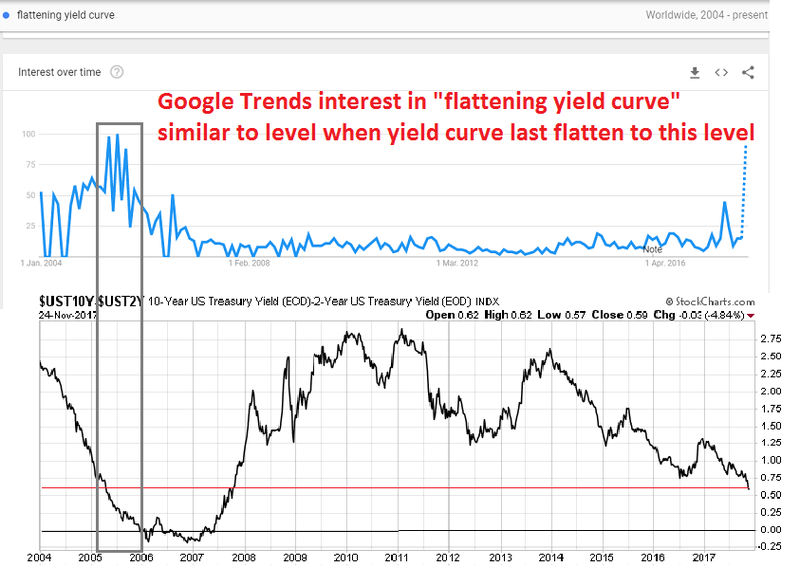 Tim Duy observed that a flattening yield curve is a typical market reaction in a tightening cycle, though it suggests that "the economy remain mired in a low rate environment for the foreseeable future" and the Fed probably didn't expect it to flatten this much. Philadelphia Fed President Patrick Harder voiced concerns about inverting the yield curve in a Bloomberg interview. The San Francisco Fed released a paper entitled, "A new conundrum in the bond market? ", that was reminiscent of Greenspan's hand wringing over the flattening yield curve even as the Fed raised rates in 2005. I agree 100%. The more the authorities pay attention to a metric, the less the metric matters. In some instances, the metric can be gamed, just like China's regional GDP growth statistics. 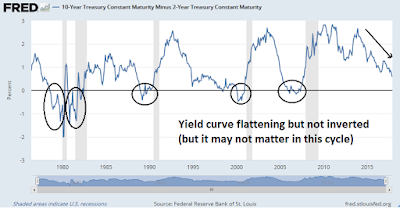 Even though an inverted yield curve has been an uncanny leading indicator of recession, it may not work this time because of the effects of the Fed's quantitative easing (and now quantitative tightening) program on the bond market. Indeed, the Fed's own estimates showed that its QE programs had pushed the 10-year yield down by 100 bp, which had the effect of manipulating the shape of the yield curve. There are sufficient contrary indicators that the economy is booming, and the near-term odds of a recession is low. Those conditions are consistent with my belief that the stock market is undergoing a terminal blow-off phase, but Scott Grannis' work also hint at how investors might look for signs of a market top. Investors can embrace the blow-off, but I can also offer you some risk control techniques that can act as a kind of stop-loss discipline. 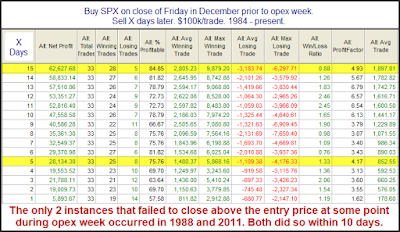 Round number-itis at SPX 2600? Mid-week market update: The mid-week market update is being published a day early because of the shortened trading week due to American Thanksgiving on Thursday. You can tell a lot about market psychology by the way it reacts to news. Early Monday morning (Europe time) and before the market open, a grim Angela Merkel announced that coalition talks had collapsed, and she was unable to form a government. DAX futures instantly took a tumble, and so did US equity futures. Over the course of the European trading day, equity prices recovered and the DAX actually closed in the green. US stocks followed suit and closed with a slight gain. This was a signal that the market has a bullish short-term bias. I issued a tactical "buy the dip" trading call for subscribers last Friday. Now that the SPX has risen to test resistance at 2600, which represents an all-time high, is it time to sell the rip? Jens Nordvig, Exante Data CEO, sent out a warning note Monday that his firm now sees a 30 to 40 percent chance of NAFTA "blowing up" by March. While Ian Bremmer, president of Eurasia Group said in a note Monday that he has long thought there was 50/50 chance NAFTA would fall apart, but he is also becoming increasingly concerned. "The big risk is that trade tension in NAFTA spreads to a more global stage, for example if the EU sides with Mexico in WTO disputes. 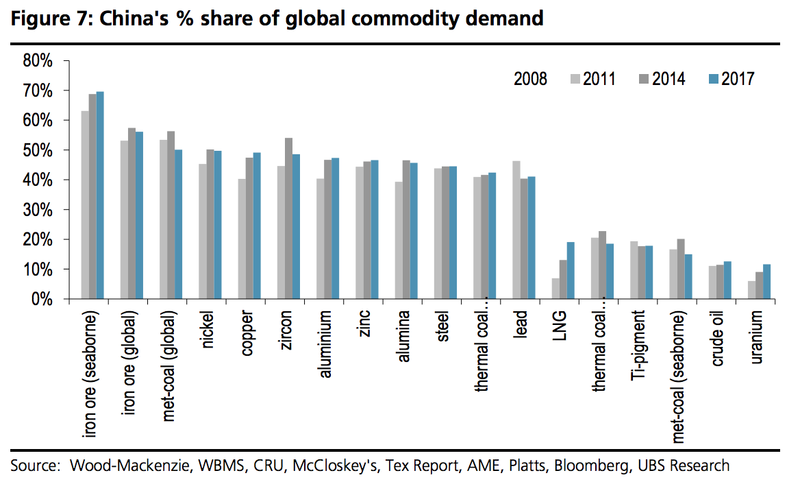 This is where the global risk grows very large," Nordvig said in an email. Canada's McLean's magazine proclaimed in an article that, "If NAFTA dies, 'all hell will break loose'". As a consequence of these trade jitters, both Canadian and Mexican equities have underperformed American ones. Relax, even if the Trump administration didn't get its way in its negotiations, the path to walking away from NAFTA will be long and difficult. It`s that time of year, when investment strategists look ahead to the following year. I favor the analytical framework of New Deal democrat, who views the economy through the prism of coincident, short leading, and long leading indicators. I agree with NDD`s latest assessment that the short term outlook is very strong. While NDD scores the long term outlook as neutral, long leading indicators have been gradually deteriorating. A continuation of the Fed tightening cycle could see downward pressure to equities from either valuation or recessionary warnings by mid-year. Enjoy the party for now. 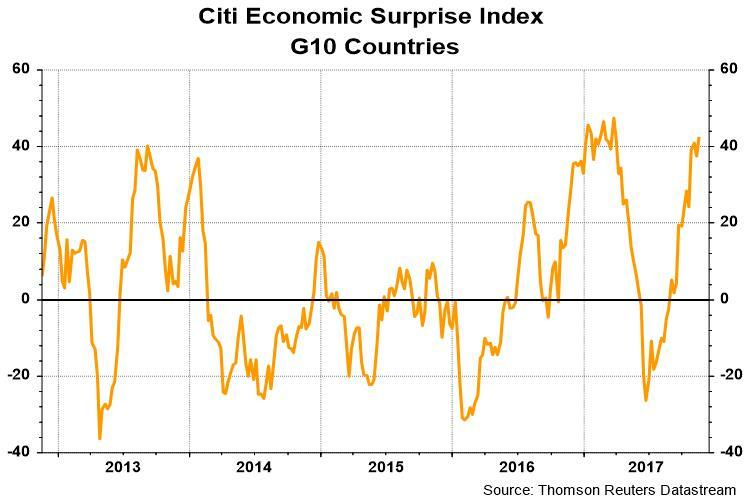 The global economy is undergoing a reflationary surge, and the outlook for Q1, and possibly Q2, is bright. Consequently, equity bulls are responding with one last charge. Be warned, however, that the early part of 2018 could be as good as it gets for this cycle. Chris Puplava observed that consumer confidence is nearing the 90th percentile level going back to 1967. Such readings have seen stock prices perform poorly over a 1-2 year time horizon. The latter half of 2018 could therefore be very bumpy. Mid-week market update: After several weeks of waiting, evidence of near-term weakness and consolidation is finally appearing. 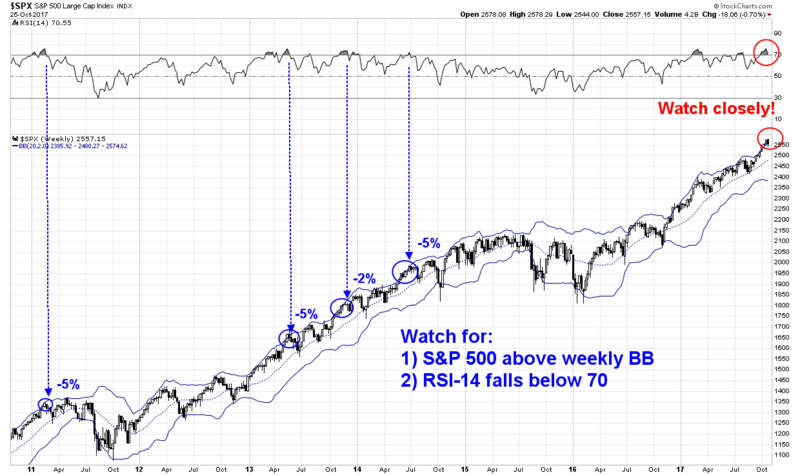 The SPX violated an uptrend this week and it is undergoing a retreat or a period of sideways consolidation. Until today, this orderly retreat in stock prices was enough to depress stock prices, but not enough to flash oversold readings. Today`s decline, however, is beginning to spark oversold readings, indicating that a tradeable bottom may occur in the next few days. Are you getting nervous about the FANG stocks? The debut of the FANG+ futures contract may mark a top for this group, as it presents an easy vehicle for hedgers to short these high beta stocks. But don't despair, consider this chart of the relative performance of a high beta group that is washed-out, and may present an opportunity for investors and traders who missed out on the FANG move. This was the week that jitters over the Republican tax bill finally caught up with stock prices. Now that both the House Republicans and Senate Republicans have different versions of a tax bill, the market is waking up to the challenges ahead. Both Houses of Congress have to reconcile their bills, which may not be easy. Further bargaining lies ahead, which has the potential to dilute the bullish effects of any corporate tax cuts. Any bill will have to overcome the twin Byrd Rule hurdle of $1.5 trillion in incremental deficit in the next 10 years, and no further deficits after 10 years. Any violation of the Byrd Rule would require 60 votes in the Senate, which would be challenging as the GOP only has a 52-48 seat majority. The Roy Moore scandal is creating additional uncertainty, as a Moore loss in the December special election in could cut the Republican majority to a single vote in the Senate. Even before stock prices got spooked, the market showed signs it was ready to go down. 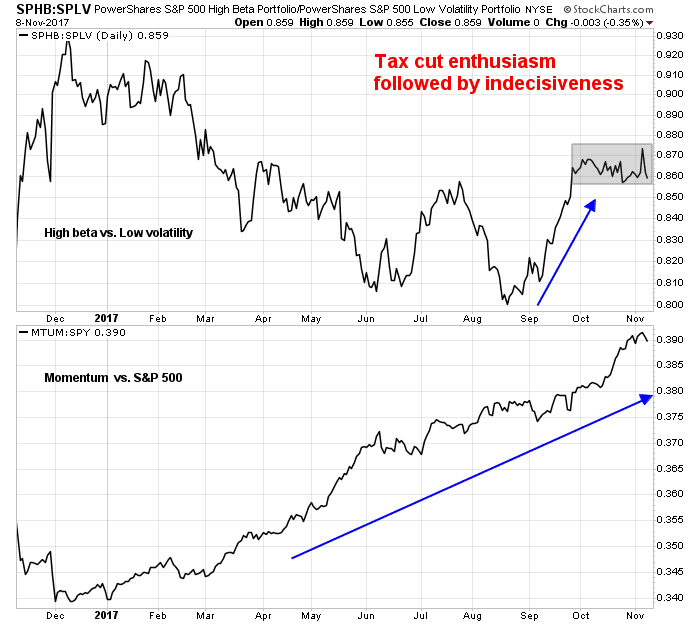 There were cautionary signals from risk appetite indicators, which signaled rising skepticism over the passage of any tax bill. 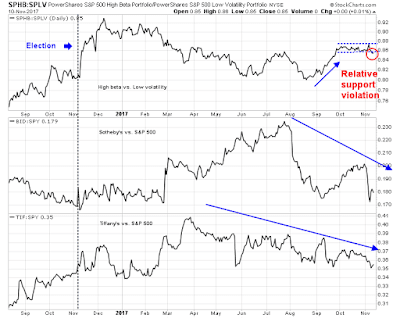 The top panel depicts the relative performance of high beta vs. low volatility stocks as a metric of risk appetite. Risk appetite perked up in September as the odds of a tax cut became more likely, then flattened out into a range. This pair broke down through a relative support on Friday. The other pairs show the relative performance of "champagne" stocks Sotheby's (BID) and Tiffany's (TIF) against the market. The "champagne" stocks have been underperforming the market for the last few months, which is another sign of market skepticism that much was going to be accomplished on the tax bill. 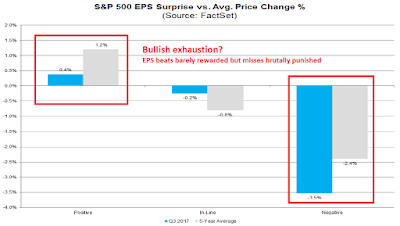 As well, the latest update from John Butters of FactSet shows that the market reaction to earnings reports may be showing signs of bullish exhaustion. EPS beats were barely being rewarded, while misses were severely punished (annotations are mine). Mid-week market update: The price action of stocks in the last few weeks makes it evident that US equities are awaiting the resolution of the Republican tax bill. This week will be critical for the progress of the bill through the House, as it is scheduled to be marked up in the Ways and Means committee. So far, the market verdict is not hopeful. 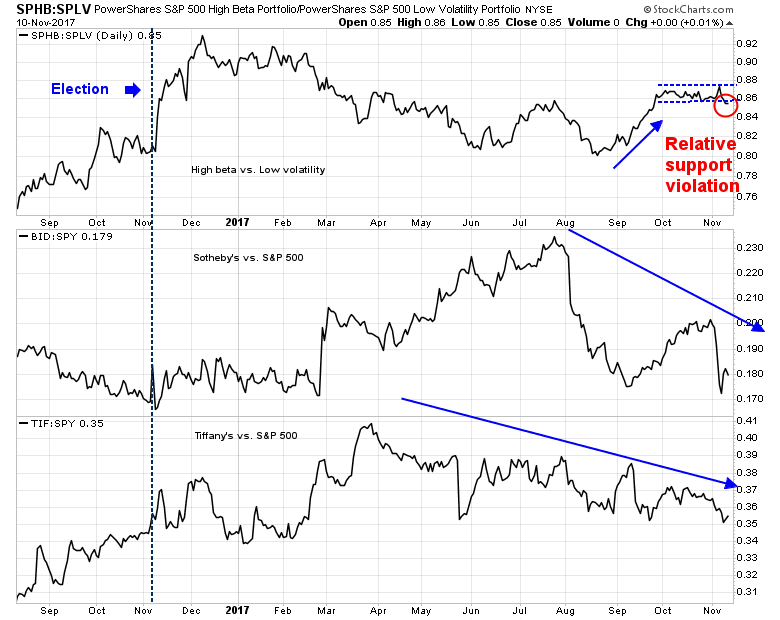 As the top panel of the chart below shows that high beta/low volatility pair, which is a proxy for risk appetite, rallied in September, followed by a range-bound market, indicating a lack of conviction. The bottom panel shows that this market has been mainly driven by momentum stocks. Other market internals are also flashing warning messages for the bulls. From a political perspective, the tax bill is also running into trouble. These are all signs of likely corrective action ahead. 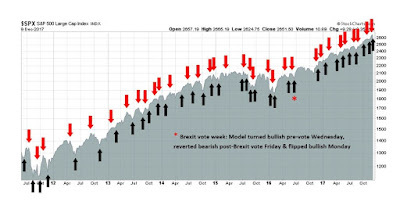 It is said that while market bottoms are events, which are sparked by emotional panic selling, tops are processes, which are the result of a series of connected episodes that depress prices. 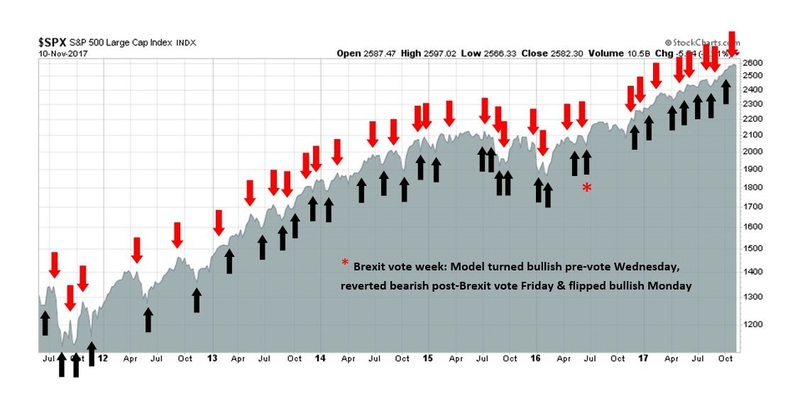 In the past few months, I have adopted the belief that the market is undergoing a topping process. Consequently, I become increasingly cautious about the stock market, though I do not believe that the ultimate top has been seen yet. 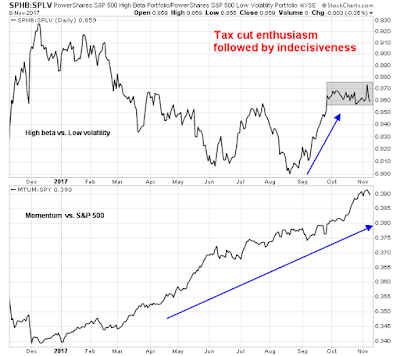 Positive momentum: The market has been supported by strong price, fundamental, and macro-economic momentum. 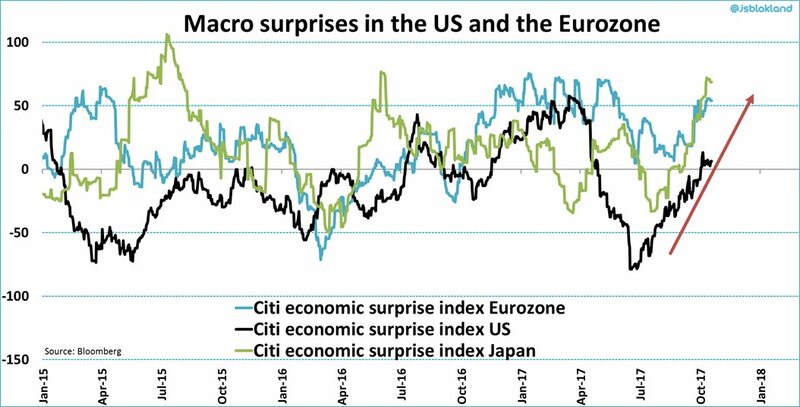 Most macro models show that the risk of recession is low or nonexistent. Sentiment: Sentiment has been frothy, which is contrarian bearish. 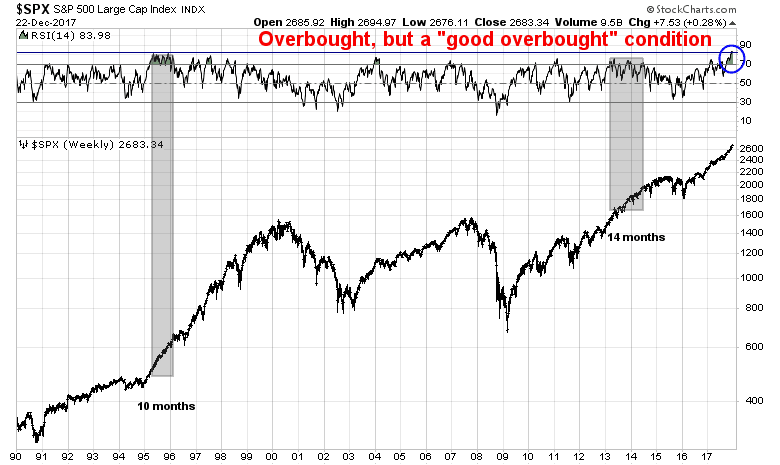 Technical: The pre-conditions for an intermediate or long-term top are not yet in place. Short-term outlook: Much depends on the fate of the GOP tax bill and the market's evaluation of other sources of risk, such as the Middle East. Under these conditions, an investor could be either bullish or bearish and be correctly positioned. It just depends on the investment time horizon. It's time for an update, and it spells caution for the bulls. 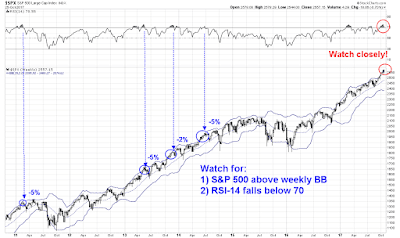 Mid-week market update: The SPX has been on an upper Bollinger Band (BB) ride on the weekly chart, and I have been waiting for a downside break on the weekly RSI-14 indicator as the signal that a correction is starting. Current readings show that the weekly RSI has not broken down below 70 tet. However, a downside break could also be seen on the daily chart. 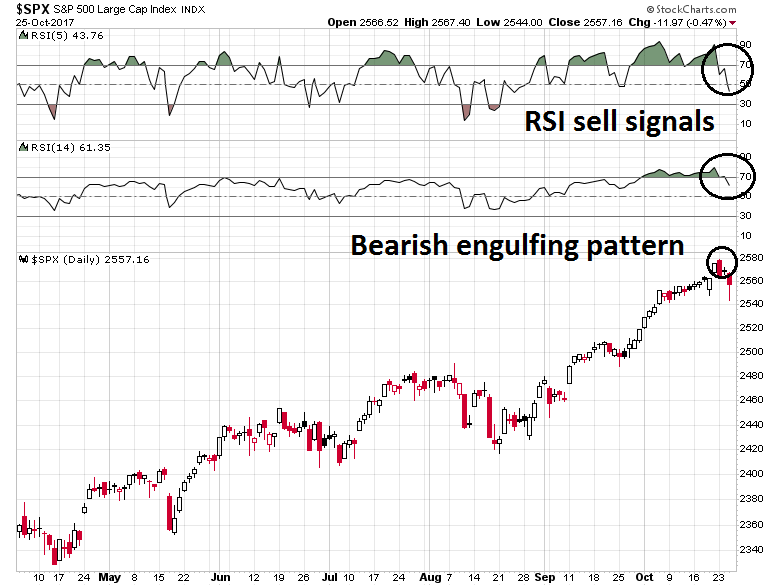 RSI-5 has broken down below 70, which is a short-term sell signal. 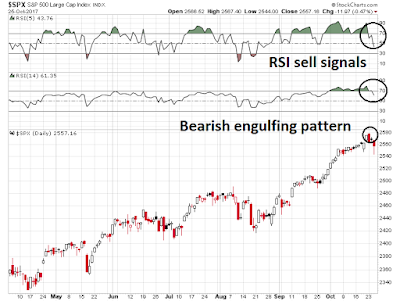 RSI-14 has also followed suit, which is another bearish sign. The index also experienced a bearish engulfing pattern on Monday, which is potentially ominous. The only way out? Invest in your own destruction. In this context, the FANG stocks are not a gimmick or a fad, they’re a f***ing life raft. Market commentators rhetorically ask aloud what multiple should investors pay to own the technology giants. That’s the wrong question when people feel like they’re drowning. What multiple would you pay to survive? Grab a raft. Copper and industrial metal prices have been on a tear lately. Prices bottomed out in early 2016, and the latest rally has seen a recovery to levels last seen in 2014. 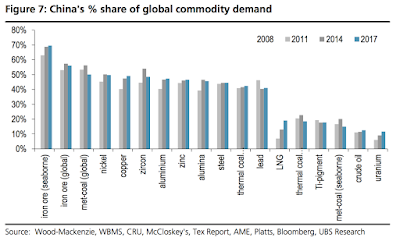 China is a major driver of commodity demand, and her economic growth has been surging recently. 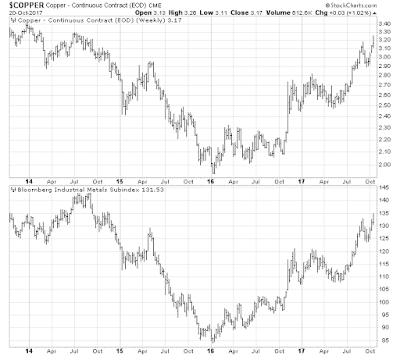 It is therefore no surprise that copper and industrial metal prices have been soaring. 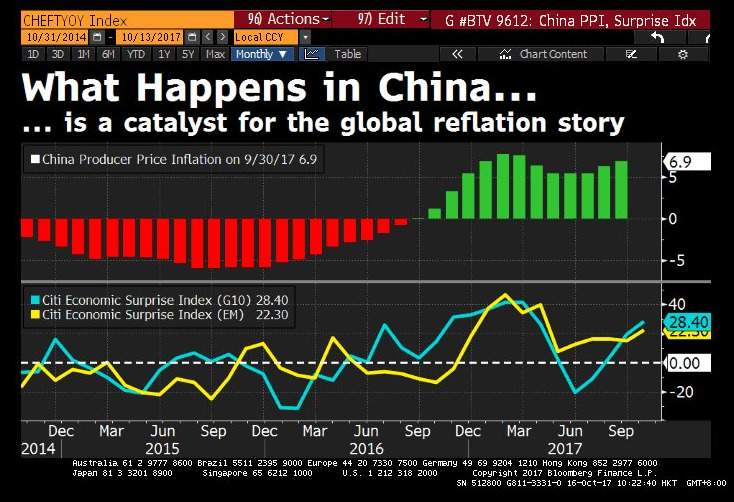 The latest upside surprise in Chinese PPI prompted David Ingles at Bloomberg to ask if China is leading a bout of global reflation. 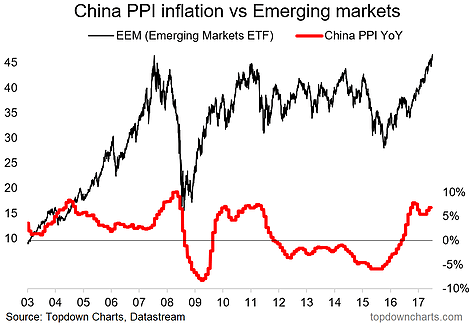 Callum Thomas at Topdown Charts also observed that China is at the epicenter of the global reflation theme. 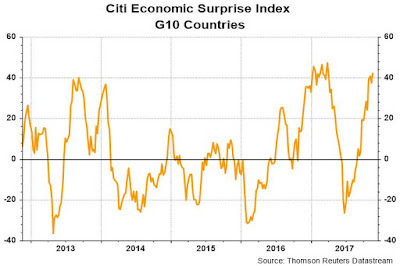 The developed markets are also experiencing a synchronized upswing. 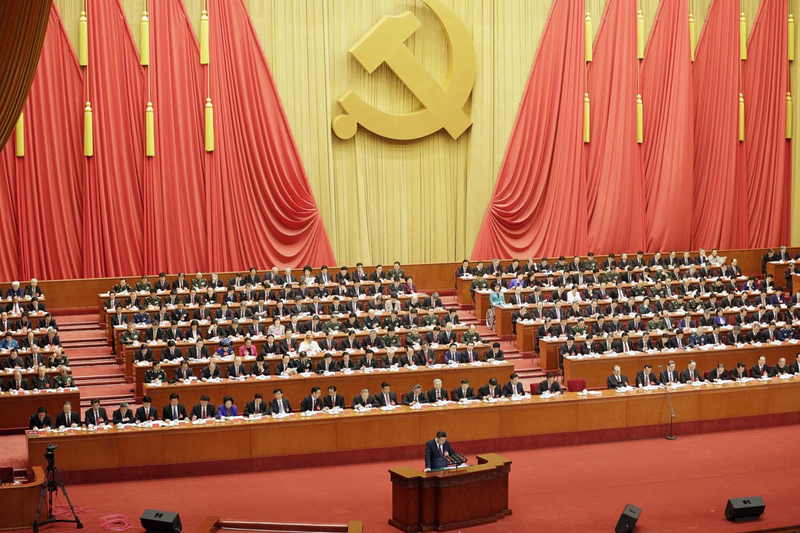 On the other hand, China is currently holding its 19th Party Congress. It doesn't take a genius to understand that any bureaucrat who creates conditions that causes either a growth slowdown or financial instability during this critical period will have made his own life very difficult. 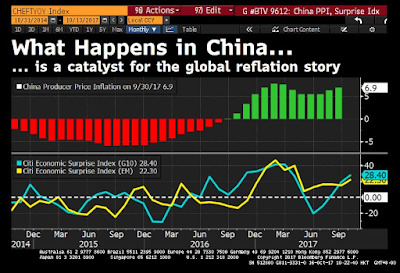 In effect, Beijing has given a 19th Party Congress put option to the market, where nothing bad would be permitted to happen to the economy ahead of the meeting. Skeptics could therefore ask if the current growth revival is real, or window dressing ahead of the Party Congress. 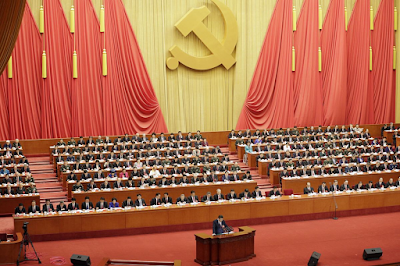 What happens after the expiry of the 19th Party Congress Put as the meeting winds up next week?